Stopped by the opening of Scott Campbell's first solo exhibition in NYC last Thursday and it was quite the scene. Put on by the good folks at OHWOW, A-ron The Downtown Don had everyone chomping at the bit to get a look at Scott's latest work. Most known for his intricately cut stacks of $1 bills, Scott creates amazing bas relief pieces. All of the hanging reliefs are stacks of bills 100 deep, some of which even have layered sheets of uncut bills straight from the mint. 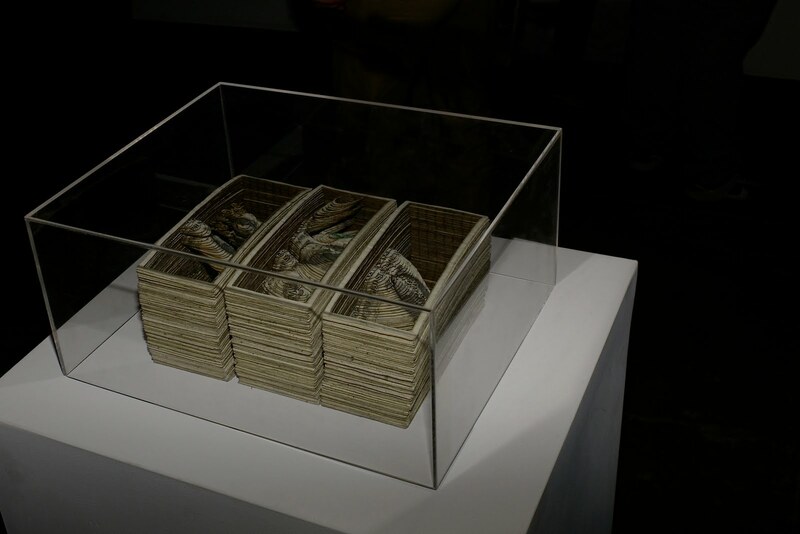 There are 2 particularly well crafted pieces (a heart and a skull) that are stacks of 500 deep. Also featured are some cool hologram paintings and a series of etchings. Gallery hours are 12-6pm, Wednesday- Sunday. If you're in the Soho area stop by 109 Crosby to get the full effect of the work. Thanks to Reed for the pics above, his new Leica M8 is really getting the job done.